Hearing is arguably the first human sense. Research has long suggested that prenatal hearing is complex; babies recognize music and voices they heard in the womb. It's therefore no surprise that audio carries emotional resonance that's sometimes separate from lyrics and content. Russian Doll leverages the emotional capacity and organizational intelligence of audio in surprising ways. The series, which debuted last month on Netflix, illustrates how sound can be deployed as a narrative device—a motor within nonlinear storytelling. A Millennial Christmas Carol meets East Village ghost story, Russian Doll is an eight-episode series that's as loopy as it is propulsive. The first two episodes wobble in all the right ways, like a top teetering before it locks into its centripetal spin in Episode Three: A Warm Body. 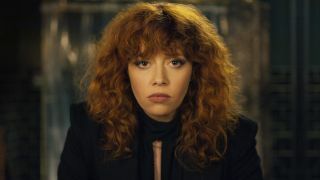 The show opens into a visual labyrinth as we chase a game designer, Nadia Vulvokov (played by Natasha Lyonne), into the fun house of her perpetual 36th birthday/deathday party. While visual motifs provide a narrative framework, the soundtrack is crucial to plot immersion. Repetition creates its own rhythm, deepening character development and signalling the eyes to scan for variations in the loop. It's an audiovisual analog to the "paranoid reader," an influential category identified by Eve Kosofsky Sedgwick, in which a highly attuned reader scrutinizes content for essential details. With clever music (supervised by Brienne Rose with series music by Joe Wong), and tight mixing and sound editing by audio masters like Lewis Goldstein, the sonic fabric of Russian Doll presents its own test for pattern recognition (or rejection). The protagonist's reset song ("Gotta Get Up") opens and closes the series, but it's also woven deftly throughout the show. Play after play, the song excerpt corkscrews into the brain, pulling you deeper into the nested mysteries. The reset tune is haunting on another level. Its vital voice, singer Harry Nilsson, died in 1994, reminding us that audio—our art, expressions, even voicemails—can outlive us. Sound is a temporal exercise, but it is unbound by mortal coil or time itself. What's your favorite soundtrack & why? Tweet @SCNmag with #SCNsounds.